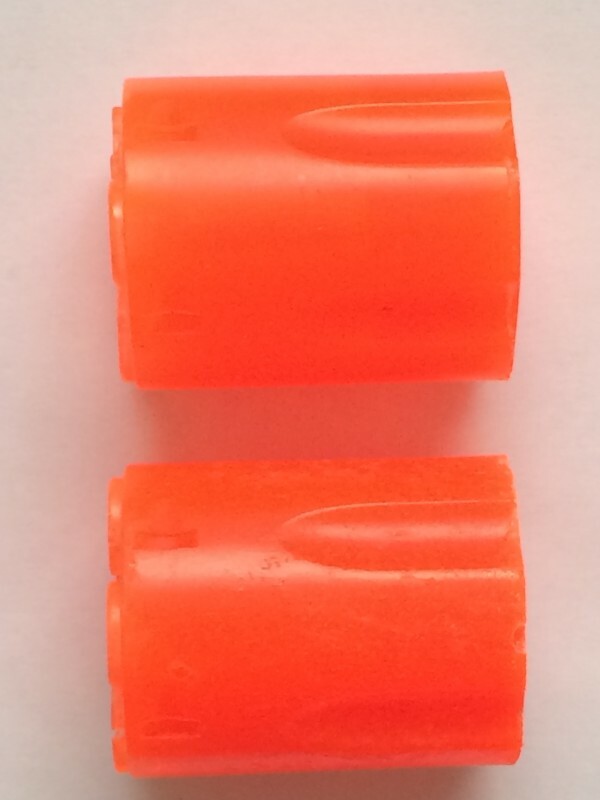 As I have discussed before, a major motivation for wanting an orange plastic cylinder in my J-frame was to have a perfectly safe way to demonstrate my Pocket-Safe hammer shrouds when visiting retailers and wholesalers who might be interested in carrying them. But I could also see the usefulness for LE trainers, CCW instructors, and folks at home who might want to practice quick draw or room-clearing at zero risk. So how to go from vague idea to product? As with the hammer shrouds, it was easy to make one for myself, but making a bunch for you was tricky enough, and fraught with errors and epiphanies enough, that I thought I’d write it up for you to see. This will take a couple months to get fully done, but let’s get started here. 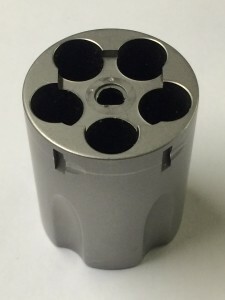 Top: cylinder cured under pressure. Bottom: cylinder cured in open air. Note bubbles and bad surface finish. The obvious first step was simply to pour silicone over a revolver cylinder and see if you could get a good reproduction of it. The answer is: yeah, sorta (regrettably I took no pictures and got rid of those things while clearing space). This was never meant to be a long-term solution, but it proved to be a much worse idea than even I had imagined, because the long rubber cylinders that filled the chambers were really, really hard to extract from the castings. They stuck no matter what. Still, that first attempt permitted the testing of different plastics and rubbers to see what might work and what definitely wouldn’t. 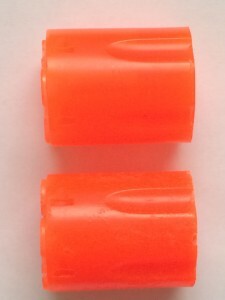 I also got to try out orange dye, which made for some visually striking cylinders. I settled on a very hard, and also very strong, two-part polyurethane. Those tests also let me see a couple of limitations of the plastic I picked. First, the amount of orange pigment had to be very limited. I attempted to use the amount from the manufacturer’s literature, but that caused noticeable cure inhibition—although in fairness, it may be that I measured poorly. The other limitation was the large number of bubbles that seemingly would not rise to the top. I didn’t know exactly what caused this at the time, but further work has led me to believe they are created as part of the curing process, because the liquid plastic looks quite clear when poured, and is also relatively thin, so that bubbles could rise freely to the top. However, once the plastic has gelled a bit, if bubbles were to form, they would not escape easily. Both problems were easily solved—only a tiny drop of orange pigment is used (and results in an excellent color anyway), while allowing the cylinder to cure in a pressure pot around 40 PSI eliminates bubbles, whatever their origin. My pressure pot (and air compressor) are from Harbor Freight, but they do the job quite well. Next time we’ll look at the process for designing a real mold for churning out functional prototypes instead of just cylinder reproductions. Get your Wall-Saver safety cylinder here.